Here I will discuss what I consider to be the essential apps for your Android tablet. First, I’m going to skip most of the native Google apps like Gmail, Gtalk, Google Maps, Google Voice, YouTube, etc. because a lot of those are pre-loaded on your tablet. I also assume that if you own an Android tablets then you like Google products and are using most of them. The criteria I used to determine my essential apps fall into general categories of daily use, optimized for tablets, and functions better on a tablet then phone. So let’s get to it. The official Twitter app was made for phones and not optimized for your tablet but thankfully TweetComb has come to the rescue. The app takes advantage of the larger tablet screen with three columns that includes your timeline, replies, and messages. If you like to tweet about everything from the meal which you’ve just eaten, to game you’re playing over at PartyCasino.it, then TweetComb offers the perfect app for managing an active Twitter account. It also includes support for multiple accounts and handles browser links within the app. Overall, a must app to keep up with your twitter feeds. You can read my full review here. The new social network Google+ is now open to all so no reason to wait for any invitations. At the same time, Google released a major update to their app which includes hangouts, messenger, and improved +1 mentions and support. The Google+ mobile app was designed well from the start and now with the improvement it becomes an essential app. 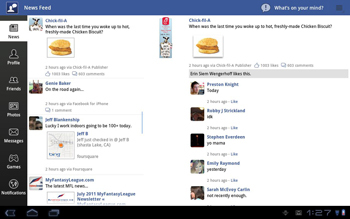 I’m not a big fan of the Facebook app and don’t understand why they haven’t yet released a tablet optimized app. There is not a lot of alternatives but I believe Friend Me is by far the best Facebook app optimized for tablets. It takes advantage of the large tablets screen with dual columns and scrolling menu bar. The app looks clean on my Galaxy Tab and performed fast without any glitches or force close. I think once you use this app you will never go back to the Facebook app on you tablet. As a sports fan I consider access to watching sports critical and any app that helps me is an essential app. 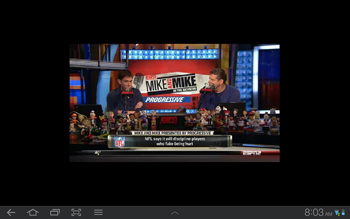 Espn has thankfully released their WatchESPN app which gives you access to live ESPN on your tablet. The only catch is that you need to have ESPN service from your cable provider. But now you don’t have to miss any second of your favorite game even if you are away from home or just want to catch up on the days sports with Sportscenter. If you love movies and have a Netflix account then you must download the Netflix app. You get access to all of Netflix streaming movies, shows, documentaries, and more right on your tablet. The increased size of the tablet really makes watching movies a joy. You can read my full review here. A great aspect of owning a tablet is the ability to watch videos from a variety of sources. Sadly the native tablet video player does not support many file formats, specially streaming videos and podcasts. Therefore, I highly recommend MoboPlayer which handles all video file formats in great quality. I use this app daily and cannot imagine my tablet experience without it. 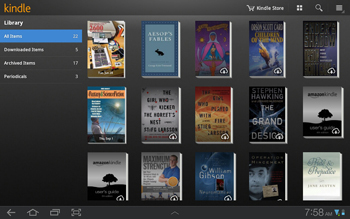 There is no doubt that the best e-reader software and app is the Amazon Kindle. You get access to thousands of books, magazine, newspaper, and more right on your tablet. A great feature of the Kindle app is that it syncs across all your devices so you can start on your tablet and pickup reading on your phone or computer. The interface is easy to use and even allows you to shop straight from the app. Are you ready to join the cloud and get rid of those messy cords? Did you ever wish that each time you get a new device you didn’t have to spend all that time to sync your music. Thanks to Google you can put your music on the cloud once and never have to transfer again. Google Music allows you to upload 20,000 songs that you can access from any device with internet access. You can also use the Google Music app on your phone and tablet. I can’t tell you how great it is not use all that space on my phone or tablet for music. Google Music is in beta currently and by invitation only but hopefully that will end soon. I have some invites left so if you can’t wait just send me an email through our contact page. I read many articles during the day and having a good news app is absolutely critical. Pulse has designed a very tablet optimized app that I highly recommend. On a single screen you have can view many articles from several news sources at one time. It has smooth scrolling bars and easy sharing options for social media sites. You can read my full review of the app here. No tablet or mobile device can go without some games to kill time. There are a lot games and categories of game to choose from but we are going to keep it basic. That means Angry Birds and Fruit Ninja HD are a must. These games need no introduction so I won’t spend the time. But I will say that these games play much better on a large tablet screen compared to the phone. Fruit Ninja has also developed a tablet specific app optimized for NVIDIA Tegra 2 based devices. In addition, I absolutely love Air Attack HD which is a top down air combat shooter game with great graphics. You will spend many hours playing this game and guarantee that you won’t be disappointed. You can read my full review here. Also checkout our game categories for more fun games on your Android tablet. If you want to be productive with you tablet that you’re going to need software for editing documents. One of the best app for viewing and editing Microsoft Word, Excel, and Powerpoint is Documents To Go. They support .doc,. docx,. xls,. xlsx,. ppt file formats and Excel 97-2003. The app normally cost $29.99 but is on sale for $14.99 so don’t wast anytime. No tablet is complete without a great keyboard and there is no better than Swiftkey Tablet X. You may already have this app for your phone and now they have released a tablet optimized version. Swiftkey boasts a unique word prediction and learning software that can be further optimized by learning from your SMS, Gmail, Facebook, and Twitter. 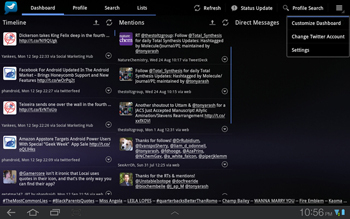 It features three themes and a split layout for thumb typing on the tablet. You can read my full review here. 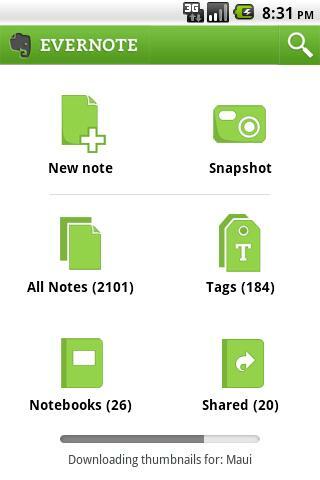 To keep yourself organized you’ll need a great note taking app like Evernote. The app not only allows you to take notes but you can also make to-do-lists, capture photos, and make voice reminders. You can sync across all your devices and share your notes by email.